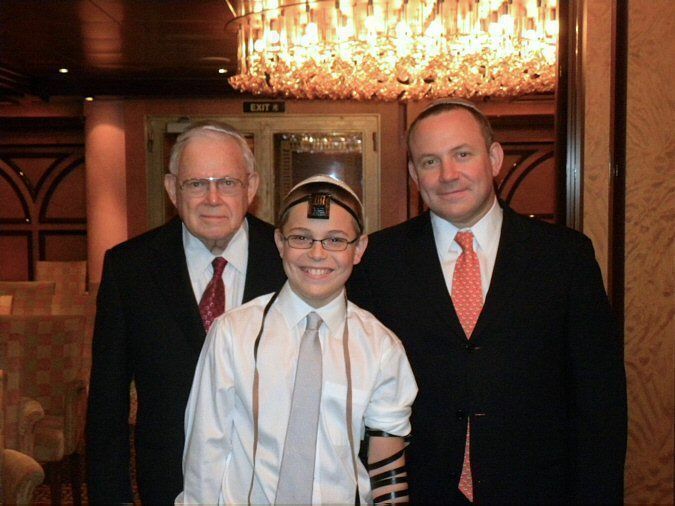 When Maritza and Jeff Weiss of San Antonio, Texas, began to plan son Warren’s Bar Mitzvah, they considered the traditional format: a temple ceremony followed by a celebration near home. But Warren is shy, and was stressed about having to perform his parts of the service before a large crowd. So the Weisses chose another option: a cruise Bar Mitzvah. They contacted Ellen Paderson, founder of Bar & Bat Mitzvah Vacations, who arranged for the Cantor who helped prepare Warren via Skype to participate and officiate at the service, and coordinated all onboard arrangements. The Weisses’ 15 family members and friends boarded the Carnival Conquest in Galveston with the ceremony planned for Monday. The Bar Mitzvah guests enjoyed the rest of the 7-day cruise with stops at Jamaica, Grand Cayman and Cozumel.